Heath Sadlier was Te Ara's lead designer from 2008 to 2012. 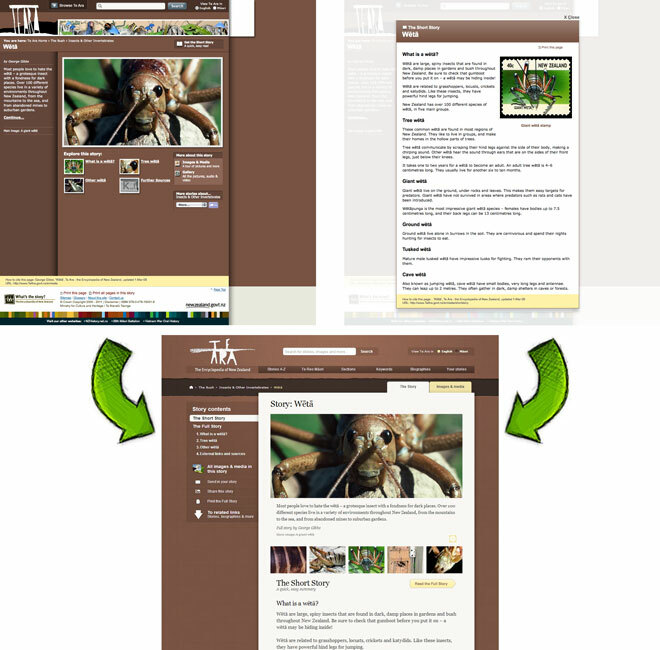 In 2011 he carried out a major redesign of the entire site, to address problems that had been identified by users, and to take account of recent technological advances. When I became lead designer at Te Ara, everything was in great shape. DesignWorks and Shift had already done an award-winning job creating the initial look and feel of the website, and the first lead designer, Helene Coulson, had laid the foundation for all the content the design team was creating. The challenge however appeared with the changing content of Te Ara. The design team had to adjust from designing insect life-cycles to trying to visually communicate economic, political and farming processes. Our goal was always to ensure that complex information could be easily understood in a diagram, and this often meant learning far more about the subject than we liked. This was similar to the other teams. The writers worked to take a subject and boil it down to a few pages. The editors replaced difficult language with plain English, and further boiled down the writer’s full story into a short story. And the resource team hunted down photos, which by themselves can tell an entire story. Every person on the team had to wade through complexity to deliver simplicity. The challenge over time became keeping Te Ara current. The content was not ageing or was easy to update, but the website’s look and feel, and its usability, were not keeping up with the time. In 2011 we launched a redesign of the site. The goal of the new design was to wrap the content, which so many people had worked so hard on, in the simple design and easy-to-use interface that it deserved. The other goal was to make it feel linked with the original design created by DesignWorks and Shift in 2004.